Teego the Cat comes home from the Vet after lilly poisoning | A Cat Called Freya, and Teego Too! Teego is fully recovered and home!!! This afternoon we got the best call ever from Jesse Davicioni, from our favourite Vets! He’d got the results from Teego’s blood test, and EVERYTHING IS PERFECT! The only other interesting result was Teego’s blood glucose was 16.9, and the normal range is 3.9 – 8.3, but he said that it was quite explainable because of Teego’s stress, so he wasn’t overly concerned. 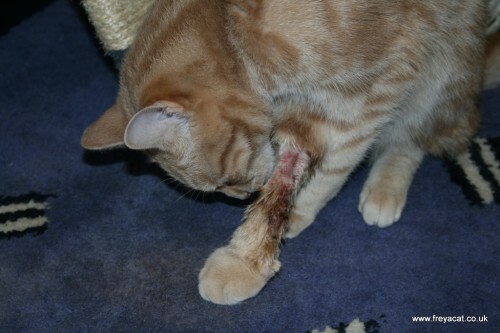 It looks a little bit greusome, as he pulled his bandages off this morning, and his catheter too, but it just looks bad. A soon as he arrived home, Freya walked straight up to him and hissed in his face from about 2 inches. Funnily enough, she didn’t back it up with anything, and he just looked back at her and then walked off. Freya followed in the only way she knew how! Dirty girl!!!! He had a little walk around, and then we made a comfy nest on my bed for him, and he curled up and relaxed and licked his leg a little. He seems absolutley fine, if a bit subdued, but he’s definately glad to be home and he’s eaten a small meal of his favourite Whiskas Chicken too. Apparently he hardly ate anything at the vet’s despite them trying about 5 different foods for him! How pampered was he??? Finally, Teego has a bit of a comedy giant paw too, as there was a very minor accident at the Vets where someone had bandaged his leg a little too tight and it had swollen up a little, but luckily Jesse spotted that and the swelling will go down shortly. 40 comments to Teego is fully recovered and home!!! You handsome orange furry purry thing!!! Oh Teego, I am so relieved and happy that you are okay! We were so worried about you! I am so glad you are home and doing better Teego!!! The girls and I are SO happy. We’ve been checking every hour for an update!!! Olive had bald spots on her neck, both front legs, and the inside of her thigh from where they were poking her. Noodle just had one shaved leg, although she too had the “big foot” for a bit. Having made it through a lily eating experience with my girls, I know how scared you all were and how guilty you must have felt — as I STILL feel guilty. All’s well that ends well — and lessons learned. After a week, then I think it will be OK to laugh at how silly Teego looked with the yellow lips!!! Again, so happy for you all!!! We are so happy he is doing well!!!! Awww poor baby with that shaved leg! Lots of kisses!!!!! Am sure Freya was just hissing at the vet smell! not at sweet Teego! Yay, Teego! Welcome home, sweet boy. Hope “giant paw” is back to normal soon. Purrs to you and Freya. We are so happy that you are home and doing great, Teego! We are happy to hear you are back home Teego and that everything is all right. We are so glad you are home,and that giant paw is silly…get well soon baby! Awwwww little Teego!! Me and Charlie are so happy you are now home!! You must rest and take things easy and eat lots and sleep lots too!! Yay!!!! Awww gorgeous Freya is absolutely delighted to see you!!! Pleased to hear that Teego is back where he belongs. We couldn’t have the Chairman of OVFM upset about his cat now could we? Yay! We’re so happy Teego is home and he is okay!! Seeing that Teego is home now has made me so happy! What a relief that his little dietary experiment did not do any permanent damage. Yay! Teego! We’re glad you are home and back in form (except for the paw as of yet). Yay! Teego, don’t go munching on yukky plants again! SO glad Teego is home!! I’m so glad he’s home safe! Stay out of the plants, Teego. 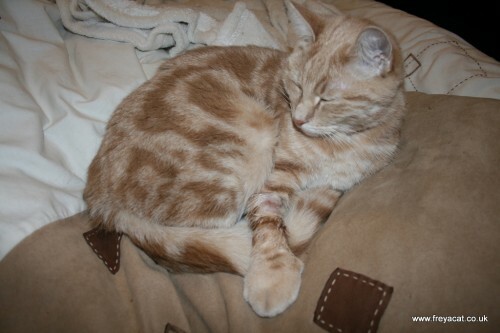 Teego we are very happy you are home again, you had a VERY close call there young fella. No more plant nibbling for you! 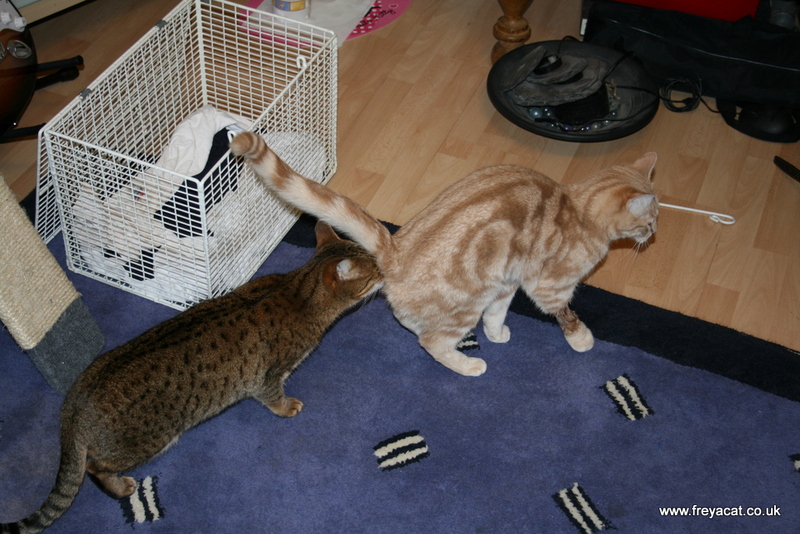 PS: Freya is only checking out Teego’s bum to make sure it’s Teego! So glad that Teego is ok…..a HUGE bullet was dodged on this one!!!! Keep the plants OUT of the house! Yay! Welcome back home, Teego! We knew you’d make it through with flying colours! You’re such a feisty little thing. So, please don’t go eating any more lilies — in fact, don’t eat anything that is NOT your food. I’m sure Freya will come around with time — after all that awful vet smell has worn off. In the meantime, sleep peacefully, little one! We are very glad to hear that he is home and doing well. Teego, you have a Badge of Courage! We’re so glad to hear you’re OK. Don’t worry about Freya hissing at you. We all smell weird when we get home from the VET. After a little while, you’ll smell OK again. Owie! 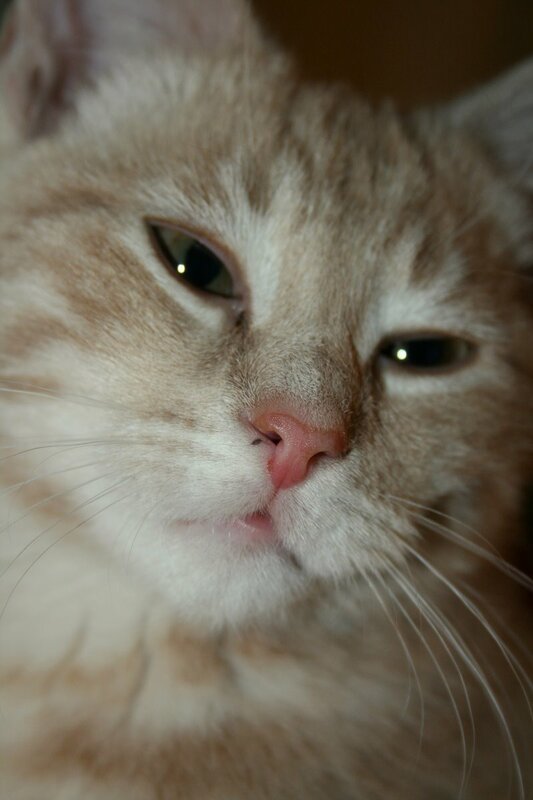 I felt so horrible when my kitty, Sele came home from the vet. from having her teeth cleaned and she had her little leg shaved too. I can only imagine the relief you must be feeling on having Teego safely home and healthy. We’re all so glad and Freya being the Norse Goddess of Love of course would want to sniff away 😉 Cheeky girl, lol.. WOO HOO!!! We are so glad to read Teego is well and home!!! Sounds real scary. I am so glad to hear that Teego is going to be OK. Hugs and purrs for a speedy recovery. Oh dear one we are glad you home! And we are so glad everything is GOOD! We saw your paw…oh my…we are glad to know that is going to be OK.
What a close call. So glad to read that everything is OK! Welcome home Teego! Glad to hear he is ok. My baby Louis ate a part of a Stargazer lily yesterday. We got him to the vet within the first 6 hours. We had no idea Lily’s were toxic!! Louis has a history of urine blockages so we knew it was critical for him to get help. $910 later, he is still in the hospital but has been urinating and his blood work came back good when he first got there. A year ago he got clogged and it boosted his creatine levels up to a 19. When the norm is under 3.0 I believe. His creatine levels were 3.4 last night.